The majority of theatres in Prague provide performances in the czech language therefore they would not be enjoyable enough for most of our clients who do not speak the language. Nevertheless, there are some that could possibly be a good and enjoyable option – Black Light Theatres and Marionette Theatre. The tricks of black light theatre are very simple: the audience cannot see black dressed actors against a black backround. That is caused by the imperfection of the human eye: the human eye cannot distinguish between black on black. Therefore, actors can operate with props in front of our eyes without being seen. Objects become equal with actors and become participants of the drama. These plays produce a perfect combination of wide screen projections, actors on the stage, puppets, artistic elements, music and live singers. Black Lights Theatres are based on basic black box tricks that are very old and ancient. They were primarily used in China for the entertainment of the emperors, later used by Japanese puppet theatres. A big revival arised in France in the 50´s led by George Lafaye, who also became known as the father of black light theatre. Also Stanislavskij and other heroes of theatre directors used tricks of black light theatre. Below here, you can see a list of the best Black Light Theatres in Prague. In case, you don´t find Black Light Theatres interesting enough Marionette Theatre may interest you. Marionettes have had a long and varied history. 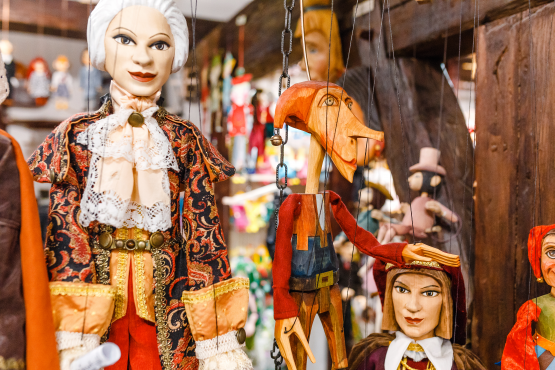 In Europe, Italy is considered to be the birthplace of the marionettes. These early puppets were used to describe morality plays to a large audience that was mostly illiterate in those days. Behaviours that would be considered inappropriate by human actors were acceptable in marionettes. In Bohemia, a big revival of marionettes arised in the 18th and 19th century. Small performances were played to children in winter times during long evenings. This was a common habit and a way of entertaiment especially among countryside people. Bohemia has long and severe winters with evenings starting between four or five o clock PM. In the countryside, there is not so much work to do either and therefore winter evenings were the most suitable times to entertain children. Of course, not only for entertaining but for creating new marionettes in people´s homes. Though today, marionettes are fun and an entertainment to delight both young and old. There is a diference between marionettes and puppets. Marionettes are distinguished from regular puppets by the fact that they are controlled by strings that are manipulated from above. This allows them a freedom of movement that is unmatched by other forms of puppetry, and this type of movement demands a great deal of skill from the person who is pulling the strings.